Sens. John McCain and Barack Obama. (CNN) - John McCain's campaign is crying foul over what it characterizes as repeated distortions from Barack Obama, saying on Friday the Illinois senator is "recklessly dishonest." The most recent dustup comes after Obama criticized McCain earlier Friday for comments the Arizona senator made in an interview on Bloomberg Television. The McCain campaign immediately took issue with the comment, noting the Arizona senator also said he knows families are facing "tremendous economic challenges." “American families are hurting and Barack Obama is being recklessly dishonest," McCain spokesman Tucker Bounds said. 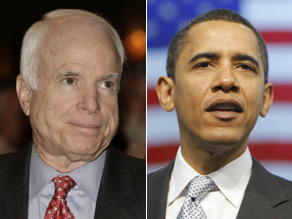 "It is clear that Barack Obama is intentionally twisting John McCain’s words completely out of context. Obama is guilty of deliberately distorting John McCain’s comments for pure political gain, which is exactly what Senator Obama was complaining about just yesterday." The McCain campaign has long argued Obama has a habit of twisting the presumptive Republican nominee's words. Referencing McCain's comments earlier this year when he said he'd be okay with some troop presence in Iraq for 100 years, Obama has said the Arizona senator "wants to continue a war in Iraq perhaps as long as 100 years." The non-partisan factcheck.org later called that characterization a "rank falsehood." Obama has since dialed back from that characterization, saying Friday that McCain is "willing to potentially maintain the troop presence there for as long as 100 years." I find it funny that they call foul when Barack points out words "out of context" yet the instant he may say something they are all over his word choice. If you can not take it do not make it. Right on Jane. DEMOCRATES UNITE!!!! When asked if he had intelligence on where Bin Ladin is in Pakistan, he said he would go after him, and McCain cried like a baby saying BHO was planning to attack Pakistan. When McCain was giving a speech he said "I would follow Bin Ladin even to the gates of Hell"... i.e i guess if he had sources that Bin was in Pakistan, then he would go after him also. Hmmmmmmm, so who is the twister????????????????????? Oh the fake outrage is so convincing. Bowl me over. Go ahead and question Obama on irrelevant stuff, whatever. It's not moral outrage about the questioning of Obama, it's just that most Americans simply don't care anymore. We want fair pay, housing, health care, and to get out of Iraq!